I'm a member of The Daily Meal's Culinary Content Network, a great group of talented food bloggers. 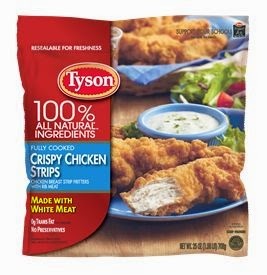 They're having a fun recipe contest this week featuring Tyson Crispy Chicken Breast Strips, which are made with 100% all natural ingredients and are fully cooked for easy preparation. These yummy chicken strips bake up crisp, and they're perfect for a meal or as part of a fun party spread. With the Super Bowl coming up this weekend, I wanted to create a spicy dish for our game-day feast. My Buffalo Ranch Puffs with Blue Cheese-Ranch Dipping Sauce are indeed spicy...and totally dude-approved! Even better? They're super simple to make! While the crescent-wrapped chicken strips bake to a golden-brown in the oven, you've got a pocket of time to make the addictive dipping sauce. Some people like to dip their wings in ranch...and some prefer blue cheese. My dipping sauce combines both flavors into one delicious sauce, then adds chopped celery and green onions for extra texture and flavor. To really up the spice factor, I decided to brush ranch-infused hot wing sauce on each puff before baking, and I included hot sauce in the dipping sauce too. Step 1: Preheat oven to 400. Place the frozen chicken strips on a rimmed baking sheet lined with parchment. Bake for 8 minutes. Roll the partially baked chicken strips in the crescents and place 2 inches apart on the baking sheet. Step 2: Add the hot sauce, butter, and ranch dressing mix in a small bowl. Microwave for 1 minute, until the butter is melted. Whisk to combine and brush some of the mixture on top of each crescent and chicken strip. It looks a bit like a scene from a horror movie afterward, but I promise the flavor is totally worth the mess! Step 3: Bake for approximately 12 minutes, until the chicken puffs are golden-brown and the chicken strips are cooked through. While the chicken puffs bake, prepare the dipping sauce. Add the sour cream, mayo, milk, hot sauce, blue cheese, green onion, parsley, celery, and ranch dressing mix to a bowl. Stir until completely combined and set aside in the fridge until you're ready to serve. Step 4: To serve, place the container of the dipping sauce in the center of a serving plate. Arrange the baked chicken crescent puffs on the serving plate in a spoke fashion. Serve with napkins -- and lots of cold beverages to douse the heat these spicy little bites bring! These appetizers are a snap to make, and they're full of the Big Flavors that we love! The dipping sauce can be made up to a day ahead, and it tastes even better once the flavors have a chance to mingle a bit. The chicken is crispy on the outside and tender inside, and the buffalo ranch glaze brushed on the outside of each puff provides tons of color and flavor. This dish was a huge hit with my husband. We had it for a weeknight dinner with some chips on the side and key lime pie for dessert. P.S. The leftover dipping sauce is fabulous with sturdy potato chips! Disclosure: I received a free package of Tyson's Crispy Chicken Strips to facilitate my entry in The Daily Meal's recipe contest. All opinions expressed are solely my own.